Set yourself apart by being the one at the trade show or special event with the crowd-pleasing cash cube. Choose from several levels to fit your budget and consider placing your logo so that participants remember you. Many of our clients have found this promotional tool to be incredibly effective - as of last count, the First National Bank of Texas has utilized 23 cash cubes with great success. Are you looking for something wild to make an impression? Consider an LR Money Machine and keep in mind we have provided these products for 20 years and are the patent holder of the technology. Our cash blowing machines are guaranteed under a full warranty for five years because we believe in the high quality of our product. 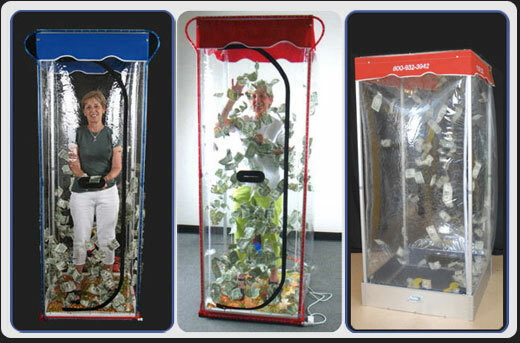 Cash cubes are lightweight and portable so you are not limited to where and when you can implement them. We will beat any competitor's price! If you need cash cube promotions then give us a call at (386) 871-2625 or fill out our contact form.